On the night of April 17, 2002, Major Harry Schmidt, an F-16 fighter jet pilot with the United States Air National Guard, believed he was taking ground fire and mistakenly dropped a laser-guided GBU-12 Paveway II bomb on soldiers from the 3rd Battalion, Princess Patricia’s Canadian Light Infantry battlegroup, conducting a night firing exercise at Tarnak Farms near Kandahar. The blast killed four and injured eight others, the first Canadian casualties of the war in Afghanistan. Poor judgment, lack of information about the friendly live exercise and failure to wait for clearance from the circling AWACS (Airborne Warning and Control System) aircraft and the Combined Air Operations Centre were all contributing factors to a tragedy that hammered home the importance of interoperability in coalition operations. Warrant Officer Jamie Murphy, a joint terminal attack controller (JTAC), was at the airfield that night and recalls the chaos and confusion. The incident highlighted a critical need to improve information sharing on the battlespace, he said. In fact, coalition deaths from multiple friendly fire incidents during the mission prompted a major effort to “coordinate better on the battlefield where everyone is,” said Captain Denis Maheu, a forward observation officer (FOO) in Afghanistan. “That was 16 years ago and technology has come a long way,” said Murphy, a master gunner. Both soldiers have been part of a team for the Director of Land Requirements (DLR) analyzing options for Joint Fires Modernization, a $100 million to $250 million Army-led project to ensure tactical, operational and strategic fires and effects information can be shared through a digital network in near real-time. The goal is a common operating picture of targets, friendly locations and command and control information that can be readily accessed by Army, Navy, Air Force and coalition assets, closing a sizeable gap in the Canadian Armed Forces’ (CAF) ability to distribute information digitally. 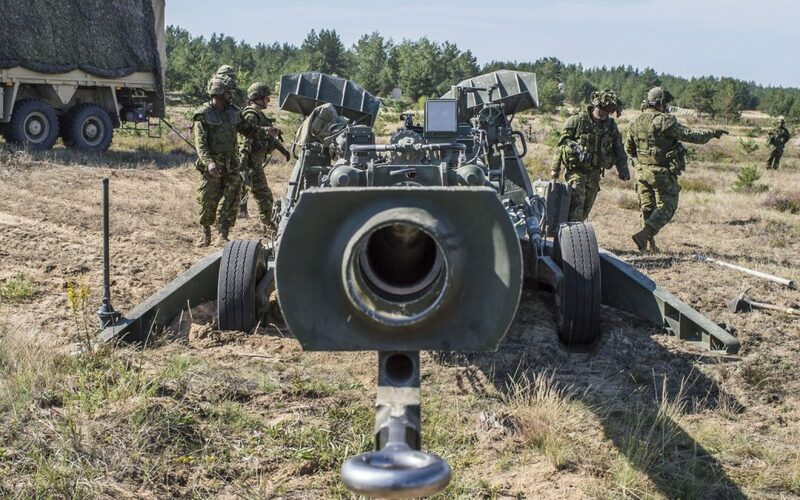 “We can do joint fires right now, but it is by voice,” said Maheu, the former project director who has since been posted to Battery Command at the 5e Régiment d’artillerie légère du Canada at CFB Valcartier. The Army took a significant step in the fall of 2017 with the introduction of a Rockwell Collins Android-based digitally-aided close air support (DACAS) system to allow FOOs and JTACS – who call in artillery and aircraft munition strikes, respectively, as part of joint fires – to exchange data digitally with Royal Canadian Air Force and coalition aircraft providing close air support and munition strikes. What’s missing, said Maheu, is the ability to share that fires data and friendly positioning between dismounted soldiers and a vehicle, and between the Army and the Royal Canadian Navy’s offshore guns. The LAV observation post vehicle (OPV), in which FOOs and JTACs often operate, has the ability to transmit information digitally through the Land Command Support System (LCSS) to artillery or a command post. But it, too, has a gap at the moment. Information acquired by the Target Observation and Fire Correction System (TOFCS) in the turret of the LAV is read out by voice to an operator in the back of the vehicle, who then enters it into the LCSS. “There is no direct link from the sensor to the guns,” observed Murphy, the deputy project director for JFM. A digital network would not only improve the speed and effectiveness of joint fires, it would also significantly reduce the likelihood of human error of operators plagued by fatigue and working under intense pressure, said Maheu. 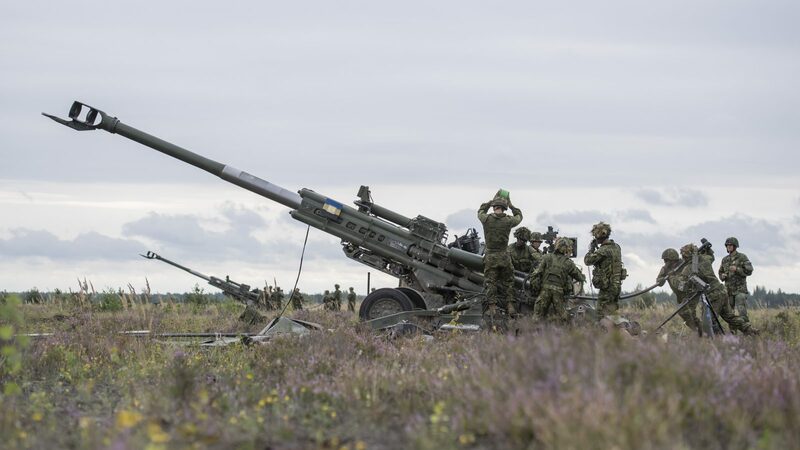 Members from 2nd Regiment, Royal Canadian Horse Artillery with the enhanced Forward Presence Battle Group Latvia conduct a live fire exercise using the M777 Howitzer gun at camp Ādaži, Latvia on 19 August 2018. Joint Fires Modernization (JFM) is actually a new name to a longstanding project aimed at improving the equipment, connectivity and simulated training for FOOs and JTACs, until recently known in the Canadian Army as forward air controllers. The scope of the project remains the same, but the focus has shifted to the network and the digitization of the information, rather than the equipment, much of which, like DACAS, is being acquired through minor capital projects. Public Services and Procurement Canada issued a request for proposals in August for a laser range finder and the JFM team is assessing options for a lighter, smaller and less battery-intensive laser designator for JTACs. Some of the momentum was also generated by the government’s 2017 defence policy, which made improvements to the CAF targeting capability a priority. For command and control software, the Army has JADOCS (Joint Automated Deep Operations Coordination Software), mission management applications for target nomination and vetting as well air operations information, intelligence operations information, battle damage assessment and campaign planning. The actual targeting, however, is done through voice, chat or email, said Maheu. In addition to command and control and targeting software, the project will also increase the simulation capability of dismounted and mounted troops, replacing the hardware and software to deliver a digital joint training network of scalable, immersive complex battlefield simulators connected to the Army’s Land Vehicle Crew Training System common computer-generated imagery. The key platform in the Army’s digitization plan will be the LAV 6 OPV, specifically the software in the TOFCS, said Maheu. As part of the LAV specialist variant enhancement (SVE) project, the Army is retrofitting 47 observation post variants with a targeting independent viewer (TIV) to improve crew situational awareness and target acquisition capability. “It is key that the upgrades they do on the OPV allow us to have the proper hardware to upgrade the software to where we need it to be,” he said. The project team will also seek to leverage investment in the digital sharing capabilities of the Integrated Soldier System Suite and the DACAS software, what he called a “de-risk project,” that could provide a first step to a broader networking capability. And it will tap the newly acquired GPS anti-jamming technology (GAJT) antenna, 52 of which were acquired this spring from Calgary-based NovAtel for the LAV 6 OPV, to protect the accuracy of satellite information for artillery units. Where a software upgrade is possible, that will be the preferred solution. But Murphy noted not all radios and other systems such as the current laser range finder are digitally capable, meaning some new equipment will be required. Connecting anything among the services generates its challenges, but integration and security classification on the network will likely prove to be the greatest. The first outreach to industry will likely be this fall with a request for information to help understand the feasibility and costing. A request for proposals will then follow in 2022. As the Army’s success with the DACAS has demonstrated, however, industry is probably already positioned to deliver. And the most important player may be a systems integrator able to connect disparate solutions, said Maheu.